Designed Building Systems are the experts when it comes to steel fabrication. Our team of dedicated steel engineers and highly skilled and professional personnel will design, fabricate, and deliver quality steel every time. We specialise in large commercial and industrial structural steel designs. 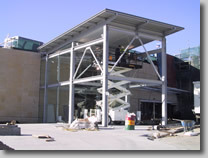 Our Company has provided structural steel works for the private and public sector in and around Sydney for many years. Some of our larger public utility works have included hospitals, schools and even jails. For the private sector we have designed and fabricated steel for numerous warehouses, shopping malls and supermarkets with names such as Woolworths, Bi-Lo, KFC and Carlton United breweries just to name a few. For further information on our works please refer to our reference page for a more complete list of our accomplishments. While many of our clients know us for our commercial and industrial structural steel building frame solutions both here and interstate, we are also experienced in the design, fabrication and erection of large scale vehicle racking systems. Recently we were commissioned by two major NSW auto groups (Mindarie Investment at Chipping Norton and Pickles Auto Group) to design, manufacture and erect their vehicle auction facility racking systems. Pickles Auto Group currently features our vehicle racking systems Australia wide including Acacia Ridge in Queensland, Milperra in NSW, Tullamarine in Victoria, Welchpool in W.A., Winnellie in the Northern Territory, Fyshwick in the ACT and Salisbury Plains in Southern Australia. The vehicle racking system is so designed to MAXIMISE the available space at minimal costs, it enables you to catalogue your vehicles and provides you with a safe working environment. The use of Onesteel steel provides a strong, durable and rigid frame, designed to with stand the varying loads of the vehicles. The system is provided in a two or three bay longitudinal module configuration, which will allow for any multiples in a continuous run and provides the versatility to cover any area. Vehicles are stored two or three high, however the frame height could be increased depending upon your needs and lifting capacity, the structures can be finished with a variety of protective systems or corporate colours (standard is safety YELLOW). Front loading dip trays are provided to the engine bay areas only to prevent oil or grease leakage from a higher vehicle, these trays are easily removed to allow for cleaning. Having a front tray only also provides the forklift driver with a clear view as to where the car is when loading and un-loading the vehicle rack. The width of the car spaces can also be varied depending upon the product to be stored, i.e. damaged or undamaged vehicles, and is flexible to accommodate modifications depending on your individual requirements. 4.5 M bay spacing is the recommended space for two cars as this provides the most satisfactory width for loading and un-loading of the vehicles. Erection is simple, and requires minimal expertise to perform the work providing the correct engineering practices are adhered to. It is recommended that the aprons to the front of the racks be concreted to provide stability for your lifting device (fork lift) when loading and un-loading the vehicles. Please contact Max White to discuss costs per vehicle space. We can design a Rack to suit your individual needs should the standard tray version not be suitable for dismantled cars (without wheels). This version would provide for the shell of the car to sit on two channel rail in lieu of the standard tray and would be supplied with out drip tray thus reduce the costs per car space installed on your concrete foundations, or even less if you purchase the racks in kit form. A combination of both types of racks may be a more suitable solution depending upon the types of vehicles to be stored. The principal design of our rack enables many different configurations to be considered thus we can adapt the rack to suit your individual needs. We (Award Winning Structural Steel Fabricators/Erectors)would appreciate your enquires and would be pleased to discuss in person your requirements.